Michael Bolla and Sally Singer lift Leon Anders using a ceiling lift and sling at the VA Hospital in Loma Linda, Calif. The VA system is among a very small number of hospitals that have installed equipment and provided proper training so their nursing staff can avoid physically lifting and moving patients themselves. 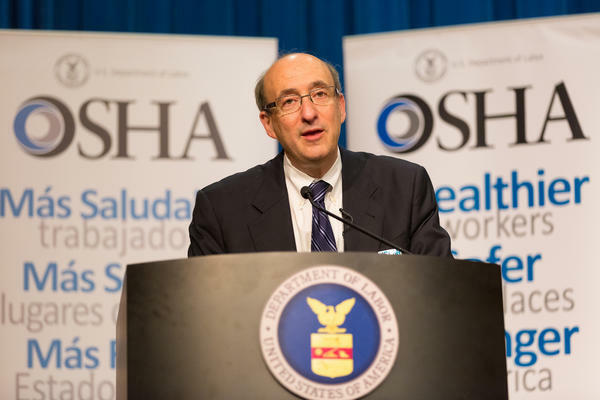 OSHA's David Michaels — shown here at an event in April 2014 — acknowledges that more needs to be done to prevent nursing injuries, but he says his agency is using "moral suasion" instead of regulations to do it. "It means that workers who are relatively young have to stop working early in many cases," says David Michaels, chief of the federal Occupational Safety and Health Administration. "They go home and they have real disabilities. They have trouble lifting up their kids. They have trouble doing a lot of the daily tasks of life, because of back injuries, arm injuries, shoulder injuries. It's a very big deal." Studies show that hospitals can reduce the number of injuries dramatically if they buy special equipment to move patients and conduct intensive training to teach the staff how to use it. For example, federal researchers found that across the vast VA hospital system, nursing injuries from moving patients have dropped by an average of 40 percent after using these strategies. And at Baptist Health, a chain of five hospitals around Jacksonville, Fla., a spokesman says they slashed the number of lifting injuries by 80 percent after installing the equipment and training the staff. But industry officials acknowledge that most hospitals haven't done the same thing. "A lot of hospitals still believe this old myth that hospitals are safe places to work," Michaels says. Government regulators haven't done much to protect nursing staff, either. The federal officials who ran OSHA in an earlier era thought they had the solution, and it would have affected far more than hospitals: On Nov. 14, 2000, just before President Bill Clinton left office, OSHA issued a sweeping new rule that required major companies across the nation to prevent "ergonomic" injuries — the injuries workers suffer to their backs, necks, arms and legs from doing tasks that repeatedly stress their bodies. OSHA's rule warned specifically about the large numbers of nursing employees who get hurt by lifting patients in hospitals, but it applied equally to businesses from auto factories to timber mills. Under the rule, companies would have to redesign their workplaces if multiple employees developed ergonomic injuries while doing the same job. The nation's business leaders mounted a national campaign against the rule, predicting that it wouldn't prevent workplace injuries but would cost so much money to implement that some companies would shut down. Only weeks after OSHA issued the rule, Republicans took over the White House and Congress, pledging to block or overturn what it considered to be burdensome federal regulations. Congress killed OSHA's rule. Still, nursing groups, labor unions and public health advocates were undeterred. They tried to persuade state legislators to pass narrow laws aimed specifically at hospitals, requiring them to buy equipment to move patients and adopt other strategies to prevent nursing employees from injuring their arms and backs. But in one state after another, their campaigns stalled. For example, in Missouri, Judy Morgan, a Democratic legislator and former teacher, introduced a bill in 2013 that required "replacement of manual lifting and transferring of patients" with machines and teams of lifters. Her bill was tough: "Any hospital that violates the provisions of this section," the bill declared, "shall be subject to a civil penalty of up to $5,000 a day" for each violation — and those fines quickly doubled for any hospital where administrators didn't comply. Missouri's hospital industry opposed the bill. So did the chairman of the key legislative committee that considered it, Republican Rep. Keith Frederick. "Of course, we are all very interested in preventing any sort of injury to our nursing staff," says Frederick, who runs the Health Care Policy committee in Missouri's House of Representatives. But Frederick, who's also a surgeon, says bills like this are too rigid and would hurt hospitals, not help them. "You say, well, what would it hurt to pass this one little government requirement?" Frederick says. "A friend of mine who's in the military used this analogy — that one little pebble in your rucksack doesn't really make much difference. But you keep adding them and you keep adding them, it gets half-full, and now it's pretty much of a load to carry. And I feel like our hospitals, and I feel like ... our small businesses, are laboring under increasing loads of government regulation." Frederick let the bill die without bringing it up for a vote. According to the nonpartisan National Institute on Money in State Politics, Missouri's hospital industry contributed more money to Frederick's campaigns than just about any other group. But Frederick says the hospitals' support did not influence his position on the bill to prevent nursing staff from getting hurt lifting patients. "And in fact before I was elected, one of the things I thought was wrong with our medical system in Missouri was that our hospitals were being overregulated," Frederick says. There are similar stories in states like Florida, Oregon, and Massachusetts — where nursing and labor groups have repeatedly pushed bills to require hospitals to use equipment and other strategies to protect nursing staffs. 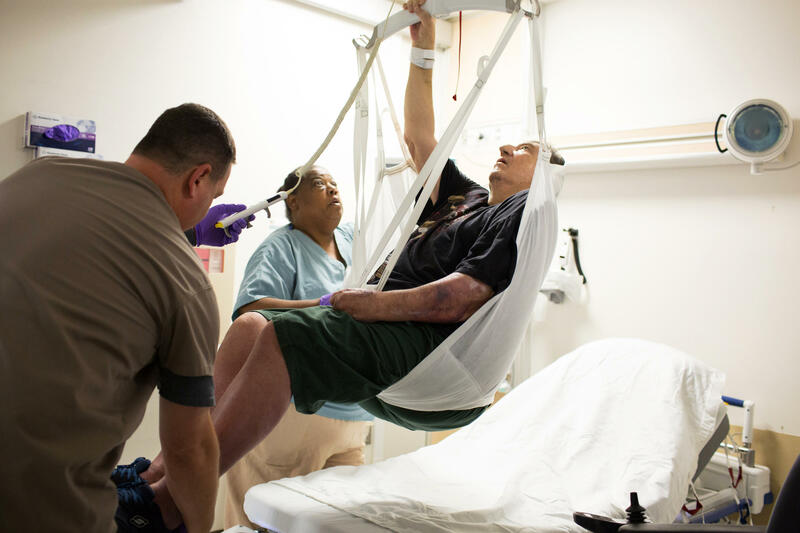 Despite the industry's opposition, 10 states have passed laws that require hospitals to prevent injuries from lifting patients — often only after years of political battles. In California, for instance, the California Nurses Association union helped persuade the Legislature to pass a bill five times between 2004 and 2008. Then-Gov. Arnold Schwarzenegger vetoed every one of those bills, saying that he would not support a "costly mandate imposed" on hospitals that were already suffering a "financial burden." The Legislature passed a bill yet again in 2011 — and this time, Gov. Jerry Brown signed The Hospital Patient and Health Care Worker Injury Protection Act into law. But even though the state laws proclaim on paper that they're designed to reduce injuries to nursing staff from lifting patients, most of them don't have many teeth to enforce it. Washington state, for instance, has had a law for almost 10 years now, which public health and nursing groups frequently cite as one of the strongest in the nation. Yet state officials told NPR that they can't find out whether hospitals are actually obeying the law and protecting nursing staff. "The only way that we can know for sure is if we do inspections," says Ninica Howard, a health and safety specialist who studies hospitals for the Washington Department of Labor and Industries. "We don't have the money and we don't have the resources." That brings us back to OSHA. Congress and then-President Richard Nixon created the agency in 1970 specifically because states weren't doing a good enough job protecting workers on their own. The law that created OSHA declared that its mission is "to assure safe and healthful working conditions for working men and women," partly by issuing regulations covering industries across the nation. OSHA's Michaels told NPR he and his staff would "love to issue smart standards" to protect nursing staff from getting hurt lifting patients. But he said the agency has no plans to do that. Since Congress struck down OSHA's ergonomics rule 14 years ago, and after a series of court rulings constrained what OSHA can do, Michaels says, "the process for OSHA to issue new regulations is broken" and the agency "can take on very few issues." "The requirements that OSHA has to go through to issue a new standard are very, very onerous," he says. "It takes us years if not decades to put out a rule." So Michaels is sending the agency's inspectors mainly to factories and construction sites where workers suffer amputations and can get killed. As for transforming the hospital industry: Michaels says he's trying to use the powers of "moral suasion." He sent out a letter to 5,000 hospital administrators "describing exactly why it's in their best interest to ... start protecting workers," he says. OSHA has also created a website and other materials that show administrators how to prevent nursing staff from getting injured. Despite those efforts, he acknowledges that "most hospitals are not yet taking aggressive action." Michaels says there's one institution today that could require hospitals to protect their nursing staffs: Congress. "There's no question, a national law requiring protection in hospitals would protect workers and would result in the reduction in musculoskeletal injuries in hospitals," Michaels says. "Not just for protecting the health and safety of the workers, but in fact they will protect the health and safety of their patients if they do the right thing." But that's pretty much where this story began. We've been reporting recently about a little-known epidemic affecting hospitals across the country. Tens of thousands of nursing employees suffer debilitating back and arm injuries every year. This happens mainly from lifting and moving patients. Hospitals could prevent many if not most of these injuries, but most hospitals don't. Today NPR's Daniel Zwerdling examines why government regulators aren't doing much about it either. DANIEL ZWERDLING, BYLINE: Most hospital executives still don't get it - that's what David Michaels says. He's America's key official in charge of protecting workers' health. He runs OSHA, the Occupational Safety and Health Administration. DAVID MICHAELS: A lot of hospitals still believe this old myth that hospitals are safe places to work. ZWERDLING: Michaels says nursing employees suffer more debilitating back and arm injuries than almost any other occupation. MICHAELS: It means that workers who are relatively young have to stop working early in many cases, but they go home and they have real disabilities. They have trouble lifting up their kids, they have trouble doing a lot of the daily tasks of life because of back injuries, arm injuries, shoulder injuries. It's a very big deal. ZWERDLING: So you might wonder, what is OSHA doing about it? Not much. Michaels is trying to persuade executives that they should prevent their nursing staff from getting hurt. MICHAELS: I sent out a letter to 5,000 hospital administrators describing exactly why it's in their best interest to do what we think is the right thing to do - we should start protecting workers. ZWERDLING: Are most hospitals taking aggressive action, or are most not? MICHAELS: Most hospitals are not yet taking aggressive action. ZWERDLING: Meanwhile, nursing workers are saying, somebody help us please. UNIDENTIFIED PROTESTERS: Yeah, yeah. Because we're on strike. Yeah, yeah. TORI NEET: My name is Tori Neet. I have been injured for two years. I was helping transfer a patient. I injured the elbow and shoulder. ZWERDLING: Tori Neet is a nursing assistant in Springfield, Ore. On a recent afternoon, she and dozens of other staff were waving signs in front of their hospital right near the emergency room. They were briefly on strike over pay, but workers like Kristi Kuipers said injuries are a big issue. KRISTI KUIPERS: Probably at least half of our staff in the last couple of years has been injured. There have been some that have been off work for almost a year. ZWERDLING: Studies show that hospitals could prevent most of those injuries if they bought special equipment to move patients, but most haven't invested the money. KUIPERS: I think it should be mandatory. Until there's a law made to make them realize that people are getting hurt, hospitals won't do it on their own. ZWERDLING: And it turns out, there was a law - once. It was early 2001, just before President Clinton left office. OSHA issued a sweeping new rule. It required companies across the country, from auto factories to hospitals, to prevent ergonomic injuries. Here's NBC. UNIDENTIFIED MAN: To Washington now, in a battle over workplace safety. ZWERDLING: Ergonomic injuries are the ones you get from doing tasks that repeatedly stress the body, like lifting auto parts or lifting patients. OSHA's rule warned specifically about all the nursing employees who get hurt in hospitals. UNIDENTIFIED MAN #2: If more than one worker is injured within 18 months doing the same job, the employer must redesign the workplace. ZWERDLING: The nation's business leaders said, no way. Before the rule went into effect they called a press conference. UNIDENTIFIED MAN #3: Testing one, two, three. Testing one, two, three. ZWERDLING: It was organized by the National Association of Manufacturers. One executive after another predicted doom. UNIDENTIFIED MAN #4: And our concern is that this rule is all cost and no benefit. UNIDENTIFIED MAN #5: And that's the devastating effect that this is going to have on the American worker. UNIDENTIFIED MAN #6: It will force some employers to move overseas. ZWERDLING: Then right after OSHA's rule went into effect, Republicans took over the White House and Congress. They said, we're against burdensome regulations, too. UNIDENTIFIED MAN #7: And ABC's Linda Douglass tells us tonight that before the day is over, businesses will likely have their way and the regulations will be repealed. ZWERDLING: Congress killed OSHA's rule. So, public health and nursing advocates decided, OK, if OSHA can't put out a national rule, let's set our sights lower - let's convince states to pass laws just to tell hospitals, you have to buy equipment to move patients so nurses don't wreck their backs. ZWERDLING: But, here's what happened. Keith Frederick is Republican chairman of the Health Care Policy Committee in Missouri's House of Representatives. Two years ago, the state nurses association and a labor union pushed for a pretty strong bill. It would give state officials the power to inspect hospitals and then fine them if they didn't protect nursing workers from getting hurt lifting patients. Missouri's hospital industry opposed it and so did Frederick in the state legislature. FREDERICK: You say, well, would it hurt to pass this one little government requirement? And a friend of mine who's in the military used this analogy - that one little pebble in your rucksack doesn't really make much difference, but you keep adding them and you keep adding them, it gets half-full and now it's pretty much a load to carry. And I feel like our hospitals - and I feel like this about our small businesses - are laboring under increasing loads of government regulation. ZWERDLING: Frederick let the bill in the Missouri State House die. You'll find similar stories in states like Florida and Oregon and Massachusetts. Keith Frederick, I did a bit of research on your background on a nonpartisan website called followthemoney.org and I see that the hospital industry in Missouri contributed more money to your campaigns then just about any individual or other industry. Has that in any way affected your position on these bills? FREDERICK: No, it hasn't. And in fact, before I even started to run - before I was elected - one of the things I thought was wrong with our medical system in Missouri was that our hospitals were being overregulated. ZWERDLING: Despite the hospital industry's opposition, 10 states have passed laws that require hospitals to prevent injuries from lifting patients. But most of those measures don't have many teeth. For instance, Washington State has had a law for almost 10 years now. Ninica Howard works for the agency that oversees it and she says state officials don't know if hospitals are actually protecting nursing staff or not. NINICA HOWARD: True. I mean, the only way that we can know for sure is if we do inspections. ZWERDLING: And do you have the resources - the money and the staff to do those inspections? HOWARD: No, we don't. We don't have the money and we don't have the resources. MICHAELS: The process for OSHA to issue new regulations is broken. We can take on very few issues. The requirements that OSHA has to go through to issue a new standard are very, very onerous. It takes us years if not decades to put out a rule. ZWERDLING: So Michaels is sending the agency's inspectors mainly to factories and construction sites, where workers suffer amputations or get killed. As for hospitals, OSHA has created a website and other materials that show administrators how to prevent nursing staff from getting injured - if hospital administrators bother to read them. Michaels says there is one institution that could require hospitals across the country to protect their nursing staff - Congress. MICHAELS: There is no question, a national law requiring protections in hospitals would protect workers and would result in the reduction in musculoskeletal injuries in hospitals. ZWERDLING: But, that's pretty much where we started this story. Daniel Zwerdling, NPR News. Transcript provided by NPR, Copyright NPR.